Convertible car seats are great, as they can be used for several years and can save you a lot of money. These seats adjust as your child grows, making it easier on you so that you don’t have to worry about purchasing a new seat each year. However, a common downside to these seats is that they are large in size. 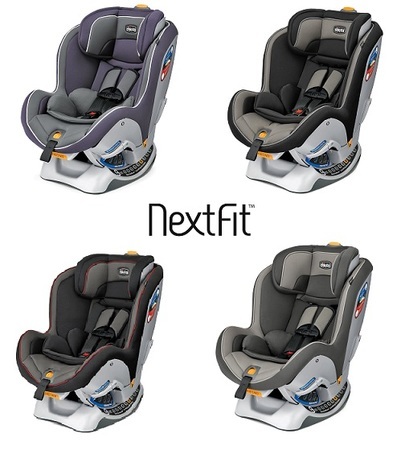 The Chicco Nextfit Convertible Car Seat, however, is a great convertible car seat loaded with tons of safety features that is also perfect for any size car, including compact cars! Chicco brand of car seats are consistently some of the best selling on the market because of their numerous safety features present in all their seats. The Chicco Nextfit Convertible Car Seat is no different, and is also sure to be the only car seat you will need to purchase for your child for several years! To begin with, this seat is used rear facing when your child weighs between 5 and 40 pounds. This wide range is not typical for rear facing seats, but is definitely a positive feature. Both the American Academy of Pediatrics (AAP) and National Highway Traffic Safety Administration (NHTSA) recommend that children remain rear facing until they are at least two years old. With this seat, most children will easily stay within this weight range until they are well past two years of age. Because rear facing is the most safe position for your child, you should absolutely take advantage of this weight limit and keep your child rear facing as long as possible. When your child weighs between 22 and 65 pounds they may use the seat as a front facing seat. Keep in mind that the weight limits for rear and front facing for this seat overlap with each other, but just because your child weighs 22 pounds does not mean you automatically need to switch them to front facing. As mentioned earlier, it is in your best interest to keep your child rear facing as long as possible. You are sure to love this Chicco Nextfit Convertible Car Seat, as it comes with tons of features that make this seat safe, easy to use, and comfortable for your child. Their ReclineSure feature is a 9-position recline feature that ensures this seat will fit in a large variety of cars, guaranteeing the seat is secure and that your child is comfortable. The seat also features a removable cup holder that can be used on either side of the seat, a great feature you and your child are sure to love, especially on long car rides. The safety features on this model are what make it so excellent. 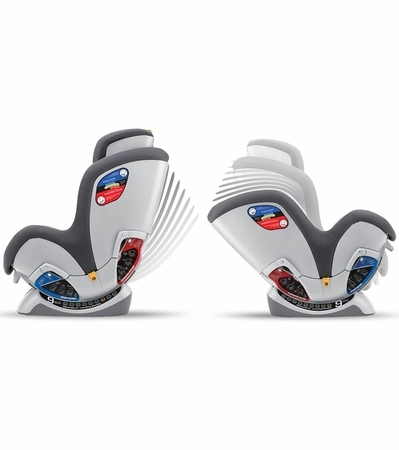 To begin with, their SuperCinch LATCH Tightener system ensures a secure and tight fight when installing the seat in your car, and their RideRight bubble level indicators help you to determine if the seat is positioned properly. Both the headrest and the chest clip are fully adjustable in order to fit properly depending on the size of your child. 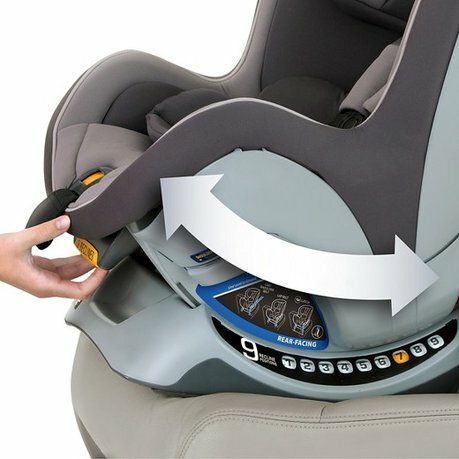 The harness protector also ensures for a secure fit every time you secure your child in the seat. For additional safety and protection for smaller children, there is a removable inner padding that provides additional support. Installing this seat is incredibly easy and their technology helps you feel confident the car seat is actually installed properly. Their system works with the LATCH system in your car and makes it easy to do without putting forth the energy required to install other seats that work with LATCH. The level indicators inspire more confidence that the seat is positioned properly. There is also an integrated slide path that makes it easy to move the LATCH strap when moving this seat from a rear facing to a front facing seat. Overall, customers really love this product. 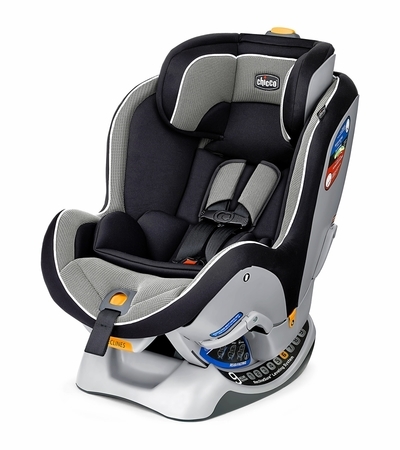 As several parents report, this car seat is rated number one by Consumer Reports when it comes to safety. Additionally, parents love that the seat can fit in a wide variety of vehicles, although the weight of the seat is commonly listed as a complaint. Kids seem to love sitting in this seat, as all of the fabric is soft and there is plenty of padding to make things comfortable. Finally, being able to remove and clean the fabric cover of the seat is a definite plus that parents noticed and commented on. Overall, the Chicco Nextfit Convertible Car Seat is a great convertible car seat that you are sure to get several years of use out of. While this is an expensive model, you are able to use it right away with your newborn and can use it both rear and front facing. Because of its high safety rating and numerous safety features, it is definitely worth the money in order to feel confident that you are doing everything you can to keep your child completely safe while in the car. The ease of use with the LATCH system is also a major plus and is one of the main reasons we love this model. We are sure you won’t be disappointed with this seat and know your child will be just as happy as you are with it!